I go for a walk along Hataitai Rd towards Roseneath most days around lunch time. Coincidentally it's the same route the number 14 bus takes although I don't travel as far! I posted about the number 14 bus route here previously. (It's actually my favourite post out of all the posts I have done!) I have been walking the same route for a few months and kept meaning to bring my camera with me as there was these cute little birds in the bushes every time I past by. The other day I finally remembered and brought my camera and took the following snaps! The first pic is one I borrowed from the post mentioned above. I find it fascinating how the car ports littered along the route have such great views. In Ireland we would have built houses on them by now. The second pic has a part of a car port in the foreground. Lucky cars! The next pics are some general views that keep bringing me back on the same old route. 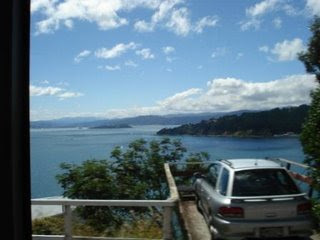 The pic above is a view towards Wellington CBD (Central Business District) with Oriental Bay and beach in the foreground. The next pic is of the bush that the birds I like feed in, I don't know the name of it though. And finally the birds in question. It took me several attempts but I finally managed to get some good pics even if I do say so myself. I don't have a zoom lens so I cropped the photographs of the birds in the bushes. It is amazing how clear they still are although a few are admittedly a bit blurry. They are primarily green but as you can see from the above pic have this striking contrasting colour around their eyes. It took me forever to find the name of the bird out. I looked up all kind of sites for NZ birds and I think there are called wet eye fantails? I think I am correct as one of the days as I was trying to take a pic a lady passing by mentioned the name also, at least I think she did! They seem to be more elusive on the internet than they are in reality!